Private and luxurious 4 bedroom villa with private pool, sauna, gym and jacuzzi. 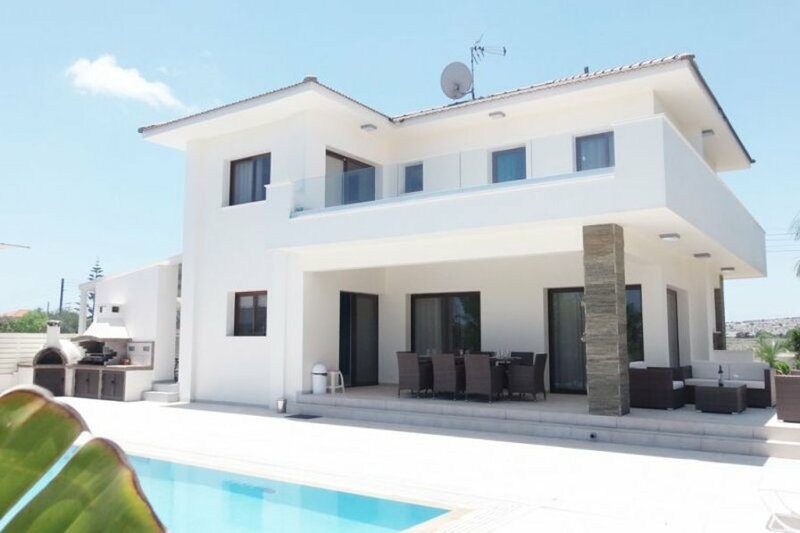 This luxurious 360 square meter villa is located between the coastal resort areas of Protaras and Ayia Napa. The highly popular Konnos Bay beach and Grecian Park hotel are located just 600 meters away. As you enter the villa you instantly get a feel of contemporary luxury. The spacious living area is ideal for a large family or group and features generous seating and a widescreen satellite TV. The villa is fully furnished to a high standard with air-conditioning throughout. Mealtimes are made simple in the fully-equipped kitchen with all the appliances required for your stay, including; clothes dryer, washing machine, fridge freezer, microwave and dishwasher. This fabulous 3 level villa is furnished to a very high standard, offering both quality and comfort and has 4 spacious bedrooms which can accommodate 8 people. On the first floor, there is a double bedroom with en-suite bathroom and w/c, 2 double bedrooms and a twin room. There is also a family bathroom. The outside area features an inviting 40 square meter pool and Jacuzzi for total holiday relaxation. The villa is set in an amazing landscaped garden with open seating and dining areas - great for enjoying an evening barbeque. As an extra luxury, the villa also offers a sauna and a gym in the basement, which also features a shower and a toilet. For those looking for a winter break the option of floor heating is available upon request. The villa also benefits from a private parking area with automatic garage door, alarm system, a complimentary wireless internet and a table tennis.